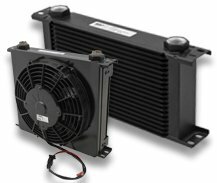 Keeping your vehicle cool is the key to maximum performance. Earls has everything you need to help dissipate that extra heat. 180 Degree Replacement Thermostat - Fits GM LS and LT Side Mount Oil Coolers LS0013ERL and 1129ERL. 210 Degree Thermostat Upgrade Kit - Fits GM LS & LT Side Mount Oil Cooler Adapters LS0013ERL and 1129ERL. 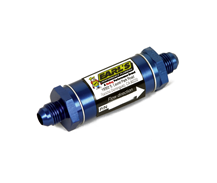 Earl's Remote Oil Filter Adapter, Billet Aluminum w/ Hardware, Fits 1968-2000 Small Block Chevy, and 1968-1990 Big Block Chevy. Use w/ -10 AN O-Ring Port Adapters. Billet Aluminum Sandwich Style Oil Thermostat with 13/16-16 Center Post, and 10 AN Female O-Ring Seals on the inlets and outlets. Cast Remote Oil Filter Mount Kit with ports facing left and right for easy selection of hose direction for 1/2 inch NPT ports Female 3/4"– 16 Thread for Single Filter Mount. Cast Remote Oil Filter Mount Kit with ports facing left and right for easy selection of hose direction for 1/2" NPT ports Female 3/4"– 16 Thread for Single Filter Mount. Cast Remote Oil Filter Mount Kit with ports facing left and right for easy selection of hose direction for 1/2 inch NPT ports Female 3/4"– 16 Thread for Double Filter Mount. Cast Remote Oil Filter Mount Kit with 1/2" NPT Ports on the Top. Female 13/16"– 16 Thread for Single Filter Mount. Sandwich Filter Adapter Center Post Size 3/4"-16 Port Size 3/8" NPT, Black Anodized Finish. Sandwich Filter Adapter Center Post Size 20 x 1.5 mm Port Size 3/8" NPT ports. Sandwich Filter Adapter Center Post Size 20 x 1.5mm Port Sizes 3/8" NPT, Black Anodized. Oil Filter By–Pass Adapter 20 x 1.5 mm. 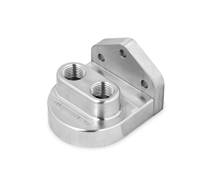 Thread Size with 1/2" NPT Ports Female Billet. Some Nissan, Subaru, Holden with spin-on filter. Oil Filter By-Pass Adapter 3/4"-16 Thread Size 1/2" NPT Female, Billet, Most Ford, Chrysler, Toyota, Nissan & V-W vehicles with spin-on filter. 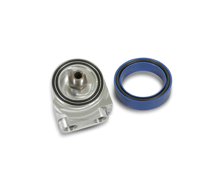 Oil Filter By–Pass Adapter 3/4"-16. 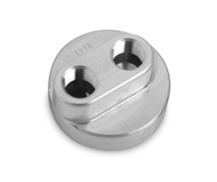 Thread Size with 1/2" NPT Ports Female billet. Some Nissan, Toyota, Suzuki. includes Banjo Bolt Screen Retaining Clip Only. included Banjo Bolt Screen & Retaining Clip Only.